My work was closed due to Hurricane Sandy so I had some unexpected sewing time. A bonus, unplanned item seemed the way to go. I sort of fondled my stash for a bit and ran across this crazy fluorescent neon safety orange sateen. I purchased it from Fabric Mart a couple years ago for $1/yd to be the trim for my Butterick 5315 piped shirtdress but I ended up using tie silk for that project instead. I was wavering whether to put it into the giveaway pile or make it into a Halloween skirt. Halloween won. I love Halloween, but there is just nowhere for a grown adult to dress up in a costume and go someplace non-horrible. It makes me sad that I've had to give it up. This lets me celebrate a little. I went digging through my skirt patterns and found Simplicity 2413. I made the pleated skirt last year in silk organza, and had made a mental note at the time to try the paper bag skirt. 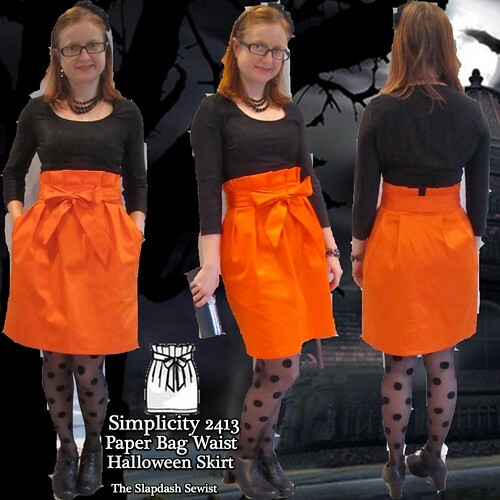 A bright orange skirt shaped like a pumpkin--what could go wrong? Both the front and back are meant to be cut on the fold; however, I always prefer a center back zip. 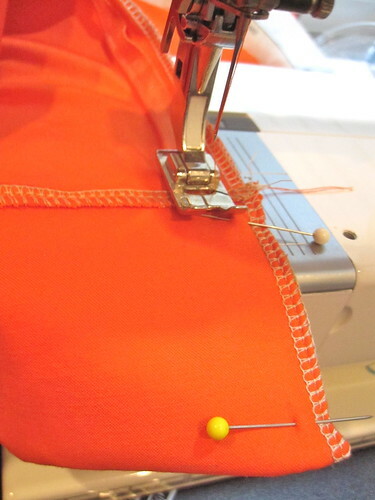 The pattern has good instructions for doing a side seam pocket with a side zip, if you prefer to make it as drafted. 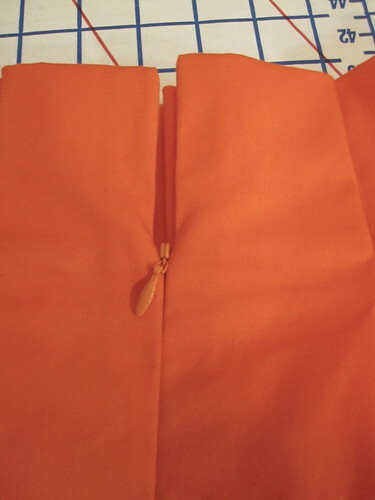 I sewed the side seams and then the zip before making the waist pleats, for easy fitting. As drafted, the zip is supposed to go up to the facing self-fold line. However, my zipper wasn't long enough for that, and I kind of liked the idea of having the paper bag portion of the waist open above the zipper, so I put the zipper stop at the waistline, letting the entire self-facing and above-waist paper bag overhang. To get a nice finish I folded the facing right sides together and stitched above the zipper. When turned right side out, it has a clean finish. 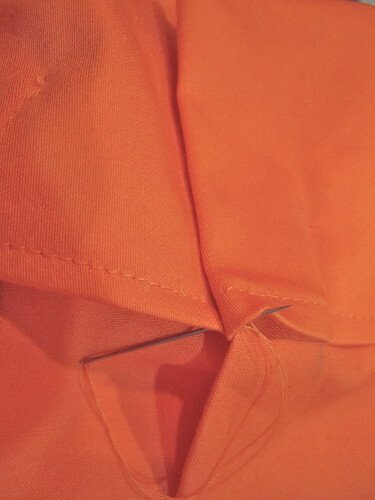 To keep the upper edges of the zipper in place I took a few hand stitches, catching the zipper tape. I turned under the upper edge of the self-facing so it would look nicer on the inside, but this created a wrinkled mess on the outside at the waist. This has to be worn with a belt or the sash. I cut an 8 at the waist, transitioning to a 12 at the hip. I ended up taking the back pleats slightly larger than marked so it was probably more like a 6 or slightly smaller, so I think this runs a bit large. 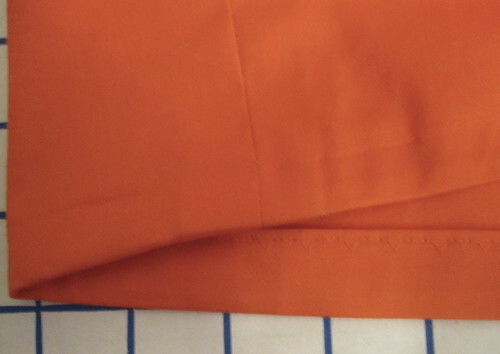 To keep the pleats facing the right direction, the instructions want you to topstitch all the way around the waist. I wasn't keen on adding another element to the already unsightly waist, so I hand-tacked the pleats to the facing. The instructions have you press the front pleats toward the sides (radiating out from the center) and continue the back pleats in the same direction, toward CB. Well, as you can see that looks pretty terrible. After seeing these photos I changed the back pleats to be pressed toward the sides as well and I think it is an improvement. The skirt can be made with or without a hem band. Without a band it is very short: 16 inches. In cutting, I lengthened it by 6 inches. I cut off two inches in hemming, so next time I'll add 4 inches. Because I was lengthening it, it is not as pegged as drafted. I went down to the drafted hem width at my 6 inches, but since it ended up being shorter than that I lost some of the pegged shape. That was fine with me, however. I wanted more leg room for walking and I can even ride a bike in this skirt, as the sateen has some stretch. I hemmed it with a machine blind stitch, using about a 1 1/4 inch hem allowance. This skirt ended up so much cuter than I expected! The pockets are a little iffy, especially in this robust fabric, but the overall shape and the paper bag detail are surprisingly flattering and also fun to wear. I'm even wondering if this could be more than a once a year novelty skirt (styled with gray instead of black). I'll keep this pattern in mind for the future. I love love love love LOVE big fat lurve that skirt. It is amazing. The color, the bow, the high waist. I love everything about it. And PS we might be in your neck of the woods in a few months. We must get together! You should be wearing Kitty Ears.....;) Great outfit! So festive! Perfect for "grown-up" Halloween. Totally perfect - absolutely wonderful!! You look great. I've been off the grid a while (still catching up) but thought I'd pop in to say this is gorgeous! Love the orange, and the shape is quite flattering. It's a good thing the fabric didn't make into the giveaway pile! I agree, I think it turned out really cute! You should definitely make it again in another color. I may have to pick this pattern up myself. I love your skirt, color and all! I have the pattern, but kinda got scared of how it would look on me.. Thanks for inspiring me. I love this shape of skirt. It looks great! I am spending the day watching horror movies and eating too much sugar - with a break for my ceramic class. Love this day. sUPER CUTE! I fondle my stash periodically too. It gets my creativity going! Woo, scary! No, it's really cute and I'd wear it whether it's Halloween or not! The Halloween "trend" (certainly not a tradition here!) has crossed the pond in recent years, but I'm not in love with the little children wearing scary costumes and roaming the streets in the dark... DD thinks I'm a spoilsport! 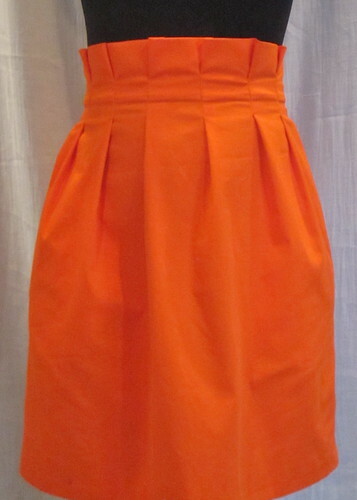 That skirt is ADORABLE in hot orange, and your whole outfit is terrific. Love the dotted tights with it. It's so stylish so you can wear it on non-Halloween days too. Wow! That's a GREAT-looking skirt. I didn't think it looked like a pumpkin; I think it looks like it's fresh off of a fashion runway. It looks terrific on you, very, very flattering. This is adorable, especially with the sash. (I can also envision it styled with cream - a nice silky blouse and some gold or copper at the neckline.) I think the crispness of the fabric enhances the silhouette - a softer fabric might drape and fall into folds. We dressed up for work, which is about as exciting as Halloween gets for me these days. This is really successful! I am surprised because I have a prejudice against paper bag waists. I just always assume they will be bulky and overwhelming. Your's is cute! Obviously perfect for Halloween, but maybe wearable Spring/summer too when mixed with other bold colours as part of the whole colour-blocking trend. This is a great skirt, really flattering. I'm sure you can come up with ways of wearing it more than once a year! You and that skirt are just too too cute to relegate to h'ween only. And thanks so much for your continuing sewing education for our community. You're an adorable gem! The skirt is super cute, great job. Very cute! And I note that you are wearing your lace up oxfords...stylish yet sensible! That's just beautiful, and it looks great on you! Happy Halloween, and a resounding success! Sorry however that Sandy rocked your coast so hard, but this is a superb finish to the equivalent of a snow day off from school. I def agree this skirt and the patttern have shown themselves true. You look great. I love it! And you're right about Halloween for adults. A few years ago my husband and I dressed up for a meetup at a neighbors', before trick-o-treating and we were the only ones with a costume! That's the cutest skirt! It's very flattering on you and has such personality. Please make another. Can't wait to see it. Cute look! I've been meaning to make this skirt too. And if you like Halloween so much, why don't you start throwing a Halloween costume party? A friend of mine does this every year and always comes up with a theme. This year was Saturday Night Live characters. It's a tone of fun and gives you some place to wear a costume to. How did I miss this post? Oh, right, Sandy. What a great skirt - it definitely deserves more than once a year wearing!